Just when Glennon Doyle Melton was beginning to feel she had it all figured out—three happy children, a doting spouse, and a writing career so successful that her first book catapulted to the top of the New York Times bestseller list—her husband revealed his infidelity and she was forced to realize that nothing was as it seemed. A recovering alcoholic and bulimic, Glennon found that rock bottom was a familiar place. In the midst of crisis, she knew to hold on to what she discovered in recovery: that her deepest pain has always held within it an invitation to a richer life. Love Warrior is the story of one marriage, but it is also the story of the healing that is possible for any of us when we refuse to settle for good enough and begin to face pain and love head-on. This astonishing memoir reveals how our ideals of masculinity and femininity can make it impossible for a man and a woman to truly know one another – and it captures the beauty that unfolds when one couple commits to unlearning everything they’ve been taught so that they can finally, after thirteen years of marriage, fall in love. Love Warrior is a gorgeous and inspiring account of how we are born to be warriors: strong, powerful, and brave; able to confront the pain and claim the love that exists for us all. This chronicle of a beautiful, brutal journey speaks to anyone who yearns for deeper, truer relationships and a more abundant, authentic life. I’m joining in again with Throwback Thursday which was created by my good friend Renee at It’s Book Talk . She started this weekly feature as a way to highlight old favorites and read books that have already been published. I have so many older books on my TBR that get ignored in favor of review copies and I figure participating in Throwback Thursday will help me to read at a least one older title a week! I usually don’t read much non fiction, but if I am in the mood, I tend to gravitate towards memoirs, there is something about someones personal story that is fascinating to me, especially when it’s just an average person sharing their life experiences. One must be honest when they’re sharing the story of their life, this isn’t fiction where you can invent situations and experiences to suit whatever type of theme you’re striving for and the author was brutally honest as she detailed her struggles with bulimia, alcoholism and her marriage. This was such a raw look at one woman’s life, she allowed herself to be extremely vulnerable in order to share deep parts of her with the world, I so admire her bravery. She doesn’t apologize for the mistakes that she made, she doesn’t feel ashamed to just be who she truly is, but she reveals the painful steps she had to take in order to become her true self and it was beautiful to witness. I found Doyle Melton to be sharply insightful and wise beyond her years, yes parts of this book were dark but I was so inspired as a woman by the nuggets of wisdom she shared. It was an intimate look at her life and her marriage which is rife with problems and beyond messy, but it was real, honest and heartfelt. If you enjoy memoirs, give this a try. Would also be good for anyone in the midst of a divorce or contemplating one. Beloved author Molly Harper launches a brand-new contemporary romance series, Southern Eclectic, with this story of a big-city party planner who finds true love in a small Georgia town. Nestled on the shore of Lake Sackett, Georgia is the McCready Family Funeral Home and Bait Shop. (What, you have a problem with one-stop shopping?) Two McCready brothers started two separate businesses in the same building back in 1928, and now it’s become one big family affair. And true to form in small Southern towns, family business becomes everybody’s business. Margot Cary has spent her life immersed in everything Lake Sackett is not. As an elite event planner, Margot’s rubbed elbows with the cream of Chicago society, and made elegance and glamour her business. She’s riding high until one event goes tragically, spectacularly wrong. Now she’s blackballed by the gala set and in dire need of a fresh start—and apparently the McCreadys are in need of an event planner with a tarnished reputation. As Margot finds her footing in a town where everybody knows not only your name, but what you had for dinner last Saturday night and what you’ll wear to church on Sunday morning, she grudgingly has to admit that there are some things Lake Sackett does better than Chicago—including the dating prospects. Elementary school principal Kyle Archer is a fellow fish-out-of-water who volunteers to show Margot the picture-postcard side of Southern living. The two of them hit it off, but not everybody is happy to see an outsider snapping up one of the town’s most eligible gentleman. Will Margot reel in her handsome fish, or will she have to release her latest catch? Have you ever read a book and felt like the author wrote it just for you? Like it truly speaks to your soul, the characters seem like your type of people and there is such a strong connection you wouldn’t be at all surprised if said characters jumped off the page and strolled into your home? That’s exactly what happened when I read Sweet Tea & Sympathy, I felt understood. That may sound silly as this book is a very lighthearted read, but it’s true! I loved everything about it from the setting of small town Georgia, to the characters and the sweet and funny storyline. I think what made me enjoy this book so much is that Margot’s sense of humor is similar to my own. She’s sharp and sarcastic, but underneath her cool exterior she has a pretty huge heart. Her burgeoning relationship with Kyle was equal parts awkward, adorable and spicy which is basically my favorite combination of all time. Besides those two you have Margot’s family, which although extremely embarrassing they made me laugh so much. The residents of Lake Sackett aren’t exactly welcoming to Margot but her altercations with some of the prissy ladies in town had me rolling. This is the start of a new series and I couldn’t be more thrilled, I already miss these characters and can’t wait to catch up with them next spring. I was utterly charmed and delighted by Sweet Tea and Sympathy and Harper is such a wonderful storyteller. Welcome to my stop on the blog tour for The Silent Fountain. Check out TLC Book Tours for the full schedule. I’m not exactly sure what I was expecting when I started reading The Silent Fountain but whatever I had been anticipating could in no way live up to my actual experience reading this little gem of a book. It had a little bit of everything and then some, there was suspense, tension, intrigue, scandal, romance all steeped in a dark and painful history. It was also extremely evocative and took me on quite an emotional journey that I won’t soon forget. This is told using dual narratives, you have Lucy in the present day who is fleeing London after a troubled past to seek work in Tuscany and then there’s Vivien in the seventies who lived in the house where Lucy will be working. This was a very compelling read but I did find myself more drawn to Vivien’s sections, I think I was just more emotionally connected to her and fully invested in her story. The pacing was great, it flipped back and forth effortlessly until things almost merged together in a heartbreaking conclusion. Fox is an amazing writer, her imagery was beautiful and I was swept away to Italy inside the walls of Barbarossa. She did an awesome job of constructing a haunting setting in the old, worn out mansion and I could easily imagine each and every scene I read. The stunning cover didn’t hurt either, I swear I kept staring at it time and time again! Fox has a new fan in me, I’ll definitely be following her closely, this was an excellent read. Victoria Fox is a bestselling author in the UK. She used to work in publishing and is now the author of six novels. The Silent Fountain is her breakout novel in North America. She divides her time between Bristol and London. NEW YORK 1900. A captivating historical drama on-board the maiden voyage of the S.S. Minneapolis featuring series character Flora Maguire. For fans of Downton Abbey. Young governess Flora Maguire is on her way home from America on the maiden voyage of the S.S. Minneapolis with her young charge Eddy, Viscount Trent, when she discovers a dead body. Unconvinced when the death is pronounced an accident, Flora starts asking questions, but following threats, a near drowning and a second murder, the hunt is on for a killer. Time is running out as the Minneapolis approaches the English coast. Will Flora be able to protect Eddy, as well as herself? Is her burgeoning relationship with the handsome Bunny Harrington only a shipboard dalliance, or something more? And what secrets must Flora keep in order to stay safe? Hey everyone, hope y’all are having a wonderful week. I have an extract from Murder on the Minneapolis to share today! Well-wishers stood four deep on Pier 39 in New York Harbour beneath a sea of colourful hats wide as sailboats, their owners waving handkerchiefs or sobbing into them. Horse-drawn carriages with crests on the doors lined up alongside hired hackneys to disgorge elegantly dressed couples and businessmen with their matronly wives, all of whom joined the clamour on the quayside taking farewell of friends and relatives. The clatter of hooves vied with shouts from newsboys and costermongers plying their wares to the waiting crowd, their voices combined in an inaudible concert. Boisterous children darted between them, miniature flags held aloft on sticks; Union Jacks and Stars and Stripes in equal numbers. Harassed nurses made vain attempts to round them up, while their parents looked on with bored disinterest. Porters strained behind loaded trolleys calling out their warnings to make way, while imperious matrons issued braying instructions for the disposition of their luggage. ‘Which was the ship we came over on three months ago,’ Flora reminded him. ‘I know, but Minneapolis is a brand new ship.’ He looked up briefly from the brochure. ‘This is her maiden voyage, and she’s carrying only seventy-eight first-class passengers and a hundred and fifty five crew. That’s almost two crew members for each passenger. Just think, Flora we’ll be the first people to travel on her.’ He tucked the booklet back into his pocket, his gaze following a man who walked past with a boy of about his own age. The man pointed items of interest out to the boy, who laughed and chatted at his side, both intent on each other. Although tall for thirteen, with well-defined features that promised to mature into male handsomeness in years to come, Edward, Viscount Trent, was still very much a child. She tried to imagine how she would feel, if her parents had packed her off back to England while they toured the Eastern United States. The question was moot, for her mother had died when she was young and, as Lord Vaughn’s head butler, her father didn’t possess the resources to send her anywhere. Flora had resigned herself long ago to viewing the peripatetic lives of the English aristocracy from the shadows. ‘I would sooner be just his son.’ Eddy broke away from her and pounded up the gangplank. ‘I’m sure.’ Thanking him with a smile, Flora shoved the card into a pocket without looking at it, and joined a queue of passengers further up the gangplank. An officer saluted her with a smile, and flattered, she stood a little straighter before proceeding to the packed deck where a group of sailors held out baskets of tightly coiled paper streamers in pastel colours. Flora grabbed a handful, pausing to allow an elderly matron to totter past with a tiny white dog on a leash. With a sharp eye open for Eddy, she eased through the press of bodies, where a barrage of feathers and silk flowers batted her face, their owners with world-weary expressions oblivious to her repeated and increasingly urgent “excuse me’s”. She spotted Eddy again on the promenade deck, where he strolled the row of doors of the suites where she guessed he was trying to find theirs. Flora started up the companionway to join him, forced to a halt at the top when a noisy family shoved past her. She stepped back to let them pass, where her attention was caught by an arrestingly pretty woman beneath the deck canopy. In a claret wool travelling coat with mutton leg sleeves and fox fur trim, she looked to be about Flora’s own age. Her features were set hard, eyes narrowed and her fists clenched at her sides in barely restrained anger. The object of her fury was older, with slightly receding hair, olive skin and thick eyebrows that met in the middle. He accepted her tirade in silence, while he repeatedly eased his collar away from his throat with a finger. Her message delivered, the lady shot him a final hard glare, swivelled on her heel and stalked away. The man inhaled deeply from a lit cheroot, shot the smoke in a straight upward stream, turned and leaned both forearms on the rail, hunched forward as if the encounter had drained him. Flora took in his yellow-stained fingers and badly cut hair as she passed, intrigued as to what someone like him could have to say to the immaculate girl in her expensive clothes. Born in London, Anita has always had a penchant for all things historical. She now lives in the beautiful Cotswolds, the backdrop for her Flora Maguire mysteries. It’s Monday! What Are You Reading? is a weekly post to share what you recently finished reading, what you’re currently reading, and what you plan on reading this week. It’s hosted by Kathryn at Bookdate. I’m obsessed with The Wife Between Us I loved it! A Season to Lie was another solid book in a series I’m enjoying. Bridges is the second in a series about female friendships and life, really good! Written in Blood was a really cool read, old school vibe with a unique killer. I listened to Let’s Just Be Friends and I always enjoy a Camilla Isley book. Beneath the Skin was a different type of psychological thriller. How was your week? Any amazing books I need to check out? From the author of The Good Neighbor and The Glass Wives comes an enchanting story of returning home and discovering what truly matters after loss. No one knows why Teddi Lerner left her hometown, but everyone knows why she’s back. Twelve-year-old Shayna— talented, persistent, and adorable—persuaded “Aunt Tee” to return to Chance, Ohio, to photograph her father’s wedding. Even though it’s been six years since Shay’s mother, Celia, died, Teddi can hardly bear the thought of her best friend’s husband marrying someone else. But Teddi’s bond with Shay is stronger than the hurt. Teddi knows it’s time to face the consequences of her hasty retreat from family, friends, and, her old flame, but when she looks through her viewfinder, nothing in her small town looks the same. That’s when she truly sees the hurt she’s caused and—maybe—how to fix it. After the man she once loved accuses Teddi of forgetting Celia, Teddi finally admits why she ran away, and the guilt she’s carried with her. As Teddi relinquishes the distance that kept her safe, she’ll discover surprising truths about the people she left behind, and herself. And she’ll finally see what she overlooked all along. This was my first book by Nathan but I enjoyed it so much that I’ll be adding her earlier work to my TBR. There was something so natural and authentic about her writing, I was almost immediately invested in Teddi’s life and that of the residents of Chance, Ohio. This was full of poignant moments and plenty of life lessons that stick with you long after you turn the final page. Teddi doesn’t want to go back home but there’s no way she can say no to Shay. When I say she left six years ago I actually mean she fled, leaving everyone she knew and loved because she was in so much pain and had no idea how to face it. Running away was easier. Her homecoming is awkward to say the least, the only person who seems truly happy to see her is Shay. I loved that Teddi’s life was far from perfect, it was totally messy but she was finally willing to face her issues head on. She was brave, honest and she had a terrific sense of humor. This book had it all, a fantastic small town setting, characters that felt like friends or people that you would want as friends, and wonderful, touching lessons about friendship, loss, love and life. It all had so much warmth, tenderness and heart behind it and I throughly enjoyed every second I spent getting to know these lovely characters. No-one remembers your past. But you do. It’s been her name for many years. But sometimes, like tonight, she forgets. Antonia has a secret. A secret so dark and so deep that she can barely admit it to herself. Instead, she treats herself to Friday night sessions of self-harm while her husband David is at the pub, and her best friend Sophie is drinking too much wine a few doors down. Nobody close to her knows the truth about what the teenage Antonia saw all those years ago. No-one, that is, except her mother. But Candy is in a care home now, her mind too addled to remember the truth. Antonia is safe. Isn’t she? The lies start small. They always do. But when the tightly woven story you’ve told yourself begins to unravel, the truth threatens to come to the surface. And then what’s going to happen? I want to start by saying that I think this book was slightly misleading only because I don’t believe it was marketed correctly, which is unfortunate. It’s billed as a psychological thriller and while I can definitely agree with the psychological aspect it’s not a true thriller by any means. It’s more of a character driven psychological drama with some unexpected developments. Despite having to adjust my expectations once I really got started with this one, I did enjoy it but I just wanted to clear that up for any future readers! This follows four different couples who all have ties to each other and the story goes back and forth between all of them, weaving in and out rather seamlessly. You have Antonia and David, Sami and Sophie, Charlie and Helen and Olivia and Mike and you’ll like some of them and loathe others, which I always think is entertaining. They were all extremely well crafted, the characterization is really the base of this book and what makes it really good. They have tangled pasts and are harboring their own secrets making for a dark, unpredictable tale. England is a really talented writer, she has a beautiful writing style with prose that flows and holds your attention. This has super slow building tension that gradually builds up, it’s structured into three parts and once the second part starts things get more intense than they were previously. There were some loose threads in the end that did leave me wanting a bit more, but overall I was pretty satisfied. I would recommend picking this up if you need a break from a typical psychological thriller, I’ve heard this described as a domestic noir and I think that is an apt and fitting label. In the autumn of 2012, destiny wreaks havoc on two unsuspecting people–Soham and Fiona. Although his devastating past involving his brother still haunted him, Soham had established a promising career for himself in Bangalore. After a difficult childhood, Fiona’s fortunes had finally taken a turn for the better. She had married her beloved, and her life was as perfect as she had ever imagined it to be. But when tragedy strikes them yet again, their fundamentally fragile lives threaten to fall apart. Can Fiona and Soham overcome their grief? Will the overwhelming pain destroy their lives? Seasoned with the flavours of exotic Nepalese traditions and set in the picturesque Indian hill station, Gangtok, The Fragile Thread of Hope explores the themes of spirituality, faith, alcoholism, love, and guilt while navigating the complex maze of familial relationships. Inspirational and heart-wrenchingly intimate, it urges you to wonder–does hope stand a chance in this travesty called life? Happy Saturday everyone!! This book first caught my eye after I read Jules review and while unfortunately I do not have room in my schedule to read this anytime soon, I was pleased to be able to interview the author! Enjoy. I write whenever I get time, at home or at the office, especially if I am in the process of writing a book. Else, I take a break and enjoy my life. My perfect writing environment would be a silent room with my laptop, a cup of black tea, a box of chocolates, and a good internet connection. Contrary to traditional belief that internet distracts a writer, I need the internet to find perfect synonyms, check if a sentence is grammatically correct, and research facts necessary for my book. Frankly speaking, I never even dreamt ofbecoming a writer. In fact, I didn’t even use to read (except for Harry Potter, which I read in my late teens). But after my father passed away four years back, some of my friends suggested me to start reading to divert my mind from the pain. I followed their suggestion, and slowly I fell in love with reading. I also began writing, starting with book reviews. Over the years, having read many books and developed my writing skills by writing several blog posts, I thought of trying my hand at writing a novel. A plot slowly developed in my mind, and soon I started writing. The rest is history. My favorite writers are Khaled Hosseini (The Kite Runner is arguably my favorite book), Renita D’Silva (a UK-based, award-nominated, critically acclaimed writer of six bestselling books), Chitra Banerjee Divakaruni (award-winning bestselling US-based writer), and J.K.Rowling (can never forget the magical experience which has become a part of my life). 4. Anything you can tell us about upcoming projects? I have not thought about it yet as I am busy promoting The Fragile Thread of Hope. Once I settle down, I will reflect on my next book. 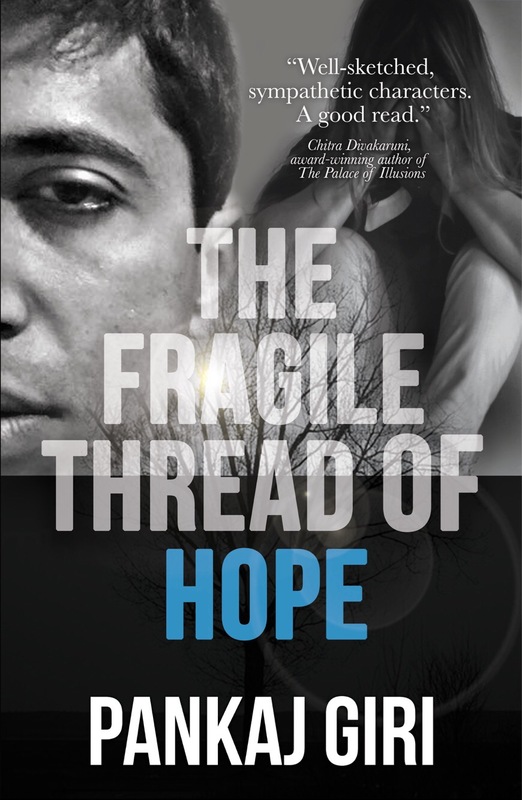 More than two years ago, the plot of The Fragile Thread of Hope took birth in my mind. Probably the story was influenced by the books I was reading at that time–the complex brotherly love between Hassan and Amir in The Kite Runner and the beautiful love between Noah and Allie in The Notebook. Those themes stuck with me, so I felt like weaving a story based on love, loss, and family relationships. Gradually, the characters developed in my mind, and scenes began taking shape and haunting me. After a few weeks, the characters began putting pressure on me, as if prodding me to bring them to life on the canvas of my novel. Then, as I finally obliged, The Fragile Thread of Hope was born. 6. Preferred method for readers to contact you? Readers can either contact me via mail (pankajgiri.ps@gmail.com) or via social media. 7. On average, how long does it take you to write a book? Generally, it takes me around a year to write a book, but editing takes a lot of time thereafter. Overall, I can produce a decently edited book in two years. 8. Which one of your characters do you relate to the most? 9. If writing wasn’t your career what would you be doing? 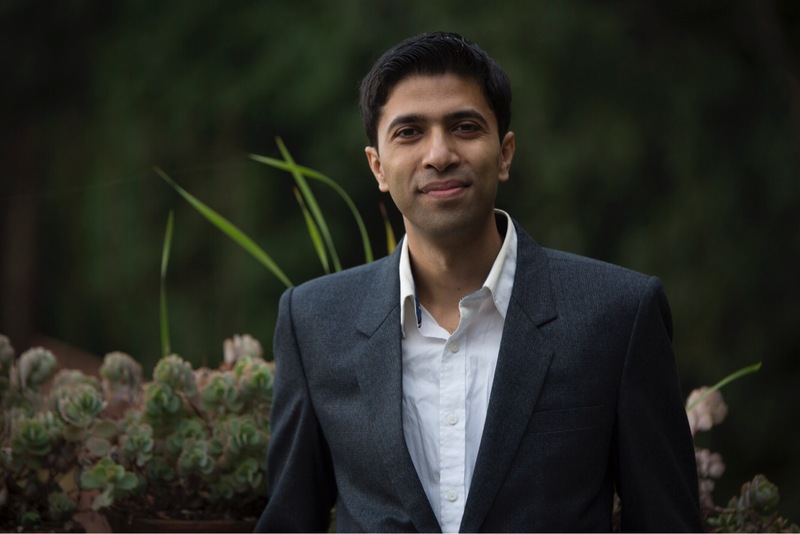 I used to work in the software industry in Bangalore, but after my father’s death, I had to relocate to Gangtok, my native place. Now, I work in a government job. But my passion lies in writing, and I devote a majority of my time on it. 10. What’s the best compliment that you’ve received about your work? When Renita D’Silva–a marvellous writer and my literary idol–read my book and said that it is one of her favorite books. Whenever I remember that, I always get a very special feeling. Pankaj Giri was born and brought up in Gangtok, Sikkim–a picturesque hill station in India. He began his writing career with a book review blog, and now, after several years of honing his writing skills, he has written a novel–The Fragile Thread of Hope, a literary inspirational fiction dealing with love, loss, and family relationships. He is currently working in the government sector in Sikkim. He likes to kill time by listening to progressive metal music and watching cricket. Rose Atwood has been in love with her best friend for years, and she’s tired of keeping her feelings under wraps for fear of getting hurt. Being Tyler’s best friend is becoming more difficult with every passing year and every new woman in his life—especially Georgiana Smithson, a snotty, beautiful girl who’s in Law School with them. Will Rose make a leap of faith and trust Tyler with her heart? Will Tyler make the right choice, or will he be too late? Let’s Be Just Friends is a fast paced, captivating novel that will keep you glued to the pages with humor, heartbreak, and romance. It’s a story about friendship, love, and the choices we make. This is the first in a series that follows a group of college aged kids as they navigate adulthood, school and love. I actually read the second book, Friend Zone first but reading them out of order wasn’t an issue for me, but naturally if you’re new to the series I would recommend starting with book one. This is told via multiple perspectives but you mainly hear from Rose and Tyler with a handful of chapters from Georgiana and her brother Ethan. Rose and Tyler swear they’re “just friends” but the only people who truly believe that are them, it’s so blatantly obvious they have feelings for each other to everyone else, they’re in total denial. Rose is single but Tyler has a girlfriend named Georgiana and she’s bound and determined to keep her man away from Rose. There is a whole lotta drama going on between these three and then when Rose meets Ethan things get even more sticky. I love Isley’s style, she writes the type of books that you can get lost in and finish in a few hours, there’s nothing complicated, well besides the characters relationships haha! They’re not too heavy and the drama makes for some great entertainment which is just what I need from time to time. Heidi Baker was a really great narrator, she had a super warm voice that was engaging and made me feel like I was listening to a friend talk to me about her crazy group of friends. Cute, uncomplicated and flirty would be the perfect description! What is it about flawed detectives that speaks to my soul? There is something about damaged protagonists with complex and dark pasts that always gets under my skin and Preach wiggled his way into my cold, black heart. Oftentimes a brooding, handsome, complicated cop is a total cliche but for some reason, it didn’t feel that way here. I immediately connected with Preach and was dying to know more about his motivations, his history and what made him the person he is today. Throw in a clever killer and what more can a girl want?! I absolutely loved the creativity behind the premise for this one, the idea of a killer referencing famous literary works was so intriguing to me. While the case Preach is working has a heavy literary vibe the author didn’t weigh down the text with too many dense, hard to decipher quotes but rather there were a handful of them that enhanced the story and brought a really intelligent aspect to the plot. This was a good old fashioned police procedural with a subtle sophistication to the authors writing style. The characterization was incredibly strong both in Preach and his fellow officer Kirby and witness Ari. The plotting was super involved and there were a ton of head spinning misdirections that left me reeling. Highly recommended for a cosmopolitan type of reader that wants a classic murder mystery with a literary bent.